1. Amodel's Mi-6 'Early Version' has been released, #72119, and very nice it is too. The quality of their mouldings seem to have taken a step forward; they've improved the clear parts, the sprue attachment points are much more delicate, and the plastic seems to be somewhat harder, so it reproduces fine details better, and the engraved panel lines are actually straight. 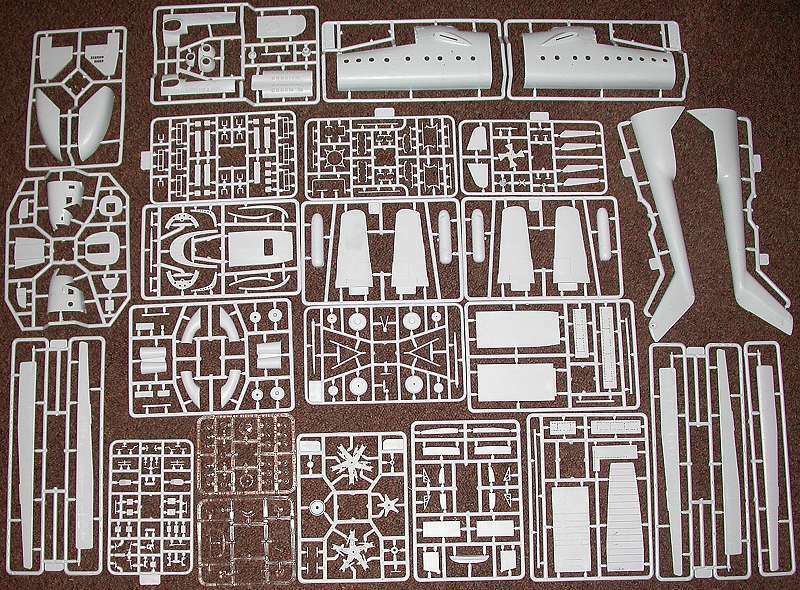 Apart from the sheer number of parts in the box, Amodel are to be commended in particular for including a ceiling for the cabin area, though all the inside surfaces lack any serious attempt at detail. Most modellers will probably want to obscure the view of the the insides of the model with a substantial load of some kind. Fortunately a huge range of suitable vehicles in the correct scale is available from Russian and Ukrainian sources. The only items in this box that are marked as 'not to be used' are a couple of clear parts and a pitot or air-data probe of some kind that will presumably be applicable to the 'Late' version that's yet to come. As has been noted elsewhere, there are also clues pointing to some parts being shared with a future Mi-10 'Harke'. The instrument panels are provided as decals, so that leaves plenty of scope for the brass-etchers, and we expect to see a resin cockpit set in the not-too-distant future. 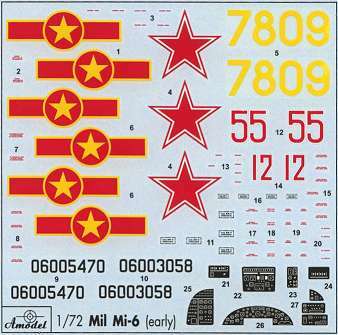 Also on the decal sheet are markings for three versions, USSR Air Force aircraft from the 1960s (grey) and 1970s (earth and olive green camo), and a North Vietnamese machine from the 1970s (olive green). 2. Italeri's re-issued 1:72 ACH-47A Gunship Chinook is now available, #1054. 3. The next helicopter kits from Unicraft will probably be the Bell HSL and the Nord 500, both in 1:72. 4. Dragon are planning a new release in their 'Air Superiority' series. This will be pair (2 kits in the box) of 1:144 UH-60Ls, #4578, which rather suprisingly will be the first Blackhawks to be kitted in this scale. Look for them in May. 5. It appears that Legato are about to release a 1:48 injection-moulded Focke Achgelis Fa-223, #48003, with markings for the 'Drache' in "Foreign Service", - Czechoslovakia, UK, and the USA. Is there a relationship between this kit and the 1:48 Fa-223 said to be coming from Special Hobby? We don't know, but it seems quite likely. 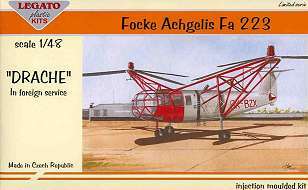 Also in the future from Legato will be a 1:48 resin Bo-105 CBS5, #LK4813. 6. As well as the 1:48 Fa.223, Fine Scale Modeler have confirmed that Special Hobby intend to give us new kits of the AH-1G and CH-37 Mojave in 2005. 7. Also according to FSM, Sanger Engineering are still proposing to release a 1:72 vacform Mi-26, but it seems likely that they'll have dropped this idea in light of Zvezda's plans to release an injection-moulded 'Halo' in 2005. These two were described and illustrated previously in HKN #196 and HKN #197. 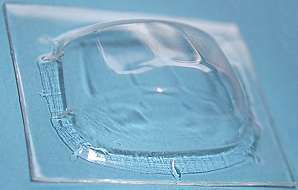 As we've mentioned before, Heliborne's products are very nicely detailed and crisply moulded, with good clear instructions. 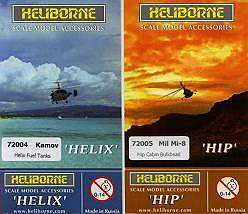 One of Heliborne's next releases will be a 'nose correction set' for the flawed 1:72 Zvezda Mi-8/17 'Hip' kits (also re-boxed by Revell) in which the shapes of the cockpit glazings are almost as bad as the ones in the old Kopro Prostejov (KP) kits. The set will consisting of replacement cockpit glazing, side doors and blister windows, cockpit roof with hatchdoor opening, and a hatch door suitable for use in both open and closed positions. This set is now about '60-70%' ready. 10. If you can't wait for the Heliborne correction & detail set, Prop & Jet have re-launched their vac-form replacement canopy #72701 in association with Ru.Modelism. As it says on their instructions, 'Good Luck!'. The only source of these canopies known to HKN is Linden Hill Imports, who are also stocking a large range of 1:72 resin Russian Weapons from Prop & Jet. It's not very easy to figure out exactly what all these products are; there seem to be various combinations of waterslide decals, rub-down decals, insignia spray masks, and data CDs. Also, some of them are available now while some are probably planned for the future. 13. Hawkeye Models Australia have ceased production, although there are suggestions that the business may re-appear under new ownership. You can read all about it in excruciating detail at the Aussie Modeller International discussion group, and in particular in this curious message from the ex-proprietor, Steve Evans. 14. The latest information from The Aviation Workshop is that their HMS Ark Royal book (complete with decal sheets) will be published at the beginning of May 2005, to be followed by an 'RAF in Germany' book (also including helicopter decals) later in the year. Their 1:72 RAF Chinook decal sheet is now due for release in late June 2005. An upcoming product that's bound to be very popular will be completely new decal sheets in 1:48 and 1:72 covering US Coast Guard Helicopters - Dolphin early & late, Jayhawk, Mako, and Pelican (1:72 only), due for release in the coming Autumn. 15. Another Russian-language book featuring the 'Hip' has been published. Written by Sergei Moroz and titled 'Mi-8 Multipurpose Helicopter', this is a 50 page softback somewhat larger than A5 format, with 8 colour profiles inside the covers. The rest of the book is monochrome, but with many nice clear photos that we have not seen published elsewhere, and a set of fold-out drawings of the Mi-8MT in 1:72. ISBN 5940380735. Thanks to Yevgeny Borissov (Heliborne), Gary Madgwick (Aviation Workshop), Andras Donaszi, and Tony Morgan. If you buy something as a result of reading about it in Heli-Kit News, please remember to tell them that you saw it here. This will encourage the flow of more news in the future, and maybe we'll even get the occasional review sample!